Kapalua, Maui (October 25, 2013) – In 1996 mountain biking and triathlon met in a duel of the fittest on the island of Maui. The race consisted of a rough water swim, a mountain bike race, and a trail run. It represented a bold new racing format that attracted outdoor enthusiasts, adventure seekers, mountain bikers and triathletes. The mountain bikers brought their laid-back style and bold self-assurance. The triathletes brought their hard-core training and avid dedication. They soon discovered a common “Live More” spirit that pulled them together. The relationship flourished into an internationally-recognized brand called XTERRA, and today there are tens of thousands of athletes not only taking part in the races, but truly living the lifestyle. A fitting representation of this “XTERRA Tribe” – 800 athletes from 35 countries and 43 U.S. states – are gathered at Kapalua Resort on Maui’s northwest coast and on Sunday, October 27 at 9am, they’ll put their mental and physical toughness up against Mother Nature at the 18th running of the XTERRA World Championship. Fans can follow it live at www.xterraMAUI.com starting at 9am Hawaii time (12 noon PST, 3pm EST, 9pm in Europe, 6am in Sydney, Australia, 8am in New Zealand, 4pm in Brazil). XTERRA MC Kalei Waiwaiole will document all the action from the swim, transitions, and finish line. There will also be streaming results available at http://results.bazumedia.com/event/results/event/event-5940. In the lead-up to Sunday’s race the XTERRA crew sat down with dozens of the sports’ biggest names including Conrad Stoltz, Dan Hugo, Josiah Middaugh, Lesley Paterson, Helena Erbenova and more. To hear their thoughts leading into the race visit http://www.ustream.tv/channel/xterralive. The pro press briefing featuring the top contenders will take place Friday at 1pm Hawaii time for the men; 1:30pm for the women. Links to listen in live are available at www.xterramaui.com, and all interviews (pre and post-race) can be found at www.facebook.com/xterraplanet. This will be the 18th straight year a nationally broadcast one-hour show is produced on the event. 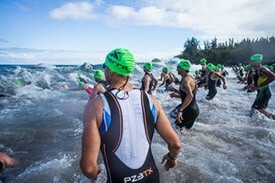 The 2012 XTERRA World Championship show was seen by more than four million viewers. This year’s show will start its run in national syndication in mid-January 2014. The XTERRA Worlds press guide complete with pro bios, previews, past results, and start lists, can be found at http://www.xterraplanet.com/uploadedfiles/2013XTERRAWorldsGuide.pdf. TEAM Unlimited is a Hawaii-based television events and marketing company, founded in 1988. It owns and produces XTERRA and in 2013 offered more than 300 XTERRA off-road triathlon and trail running races in 20 countries worldwide. In the U.S. alone nearly 200,000 participants took part in the XTERRA lifestyle last year. In addition, TEAM TV has produced more than 300 adventure television shows resulting in three Emmy’s and 42 Telly Awards for production excellence since 1990. View samples at www.xterra.tv, and learn more at xterraplanet.com and xterratrailrun.com.